Our Stay Safe Team and Mr Allsopp led a fantastic assembly on the topic of internet safety as part of our Safer Internet Week activities. They encouraged us all to think before we click to ensure everyone has a positive experience using the internet. Part of the assembly involved audience participation when they had to decide whether uploading certain photos/videos were okay or not. It was clear to everyone that we don't always find the same things as funny as our friends, so we must be careful before we say or upload anything that may be hurtful. We are aware that children are signing up with the Roblox site where there are a number of games they can play with others online. It is advertised to appeal to young children and there are parental controls you can put in place to help ensure your child’s safety. Please note however that the Roblox site itself warns that not all of the games available are actually suitable for primary school children. Prison Life and Jail Break for example involve violence and theft. It is very important therefore that you continue to monitor which games your child is playing on this site. Thank you once again for your support in keeping everyone at Belmont safe online. We were pleased to welcome LSCB e-safety officer Dan Hawbrook back to Belmont on Monday when he spent time with every class discussing how to keep safe online. From the Reception class singing and sharing the story of Smartie the Penguin to Year 5 and 6 discussing who actually owns the photos you send on apps such as Snapchat, everyone had great fun learning more about this important topic. After a very busy day, Dan led a meeting for parents after school with ideas for what they could do at home to keep their families safer online. We would all like to thank Dan for a brilliant day. You can see a super little video of the Reception Class over on their class page! As part of our ongoing esafety programme we would like to inform you that Snapchat has recently made updates to their app which are causing privacy concerns. Their new location sharing feature is called Snap Map and young people can share their whereabouts with all their friends or just a select few. They can even set it to ‘ghost mode’ where they can see where others are without sharing their own location. This can be unsettling as you’re not always aware of who is tracking your whereabouts and is obviously a safeguarding concern. If your child has access to Snapchat we advise you to discuss the implications of this new feature with them. At the moment Snap Map is switched off by default but there are various settings that may be used. There has been an assembly for pupils in key stage 2 to make them aware of the privacy concerns of this new feature and advise them how to keep safe online. Further information can be found via the Snapchat Safety Centre. 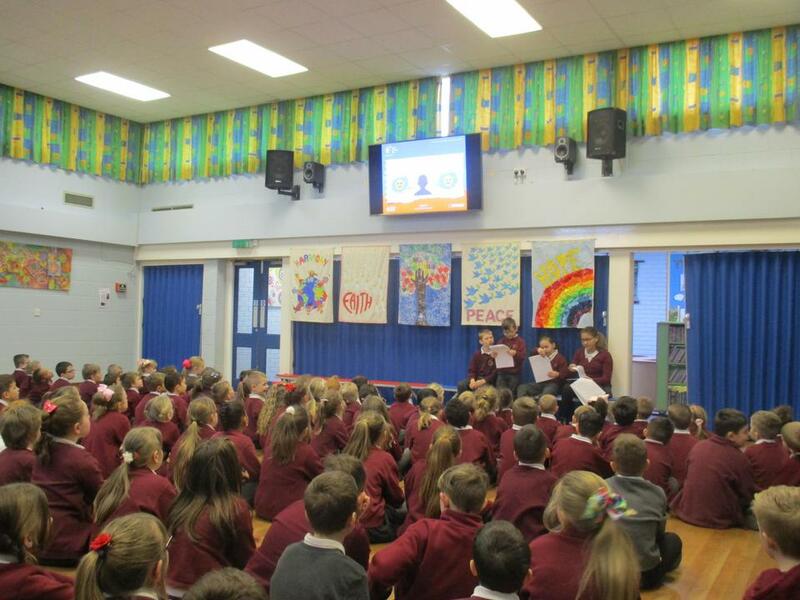 Once again the whole school had the opportunity to find out more about keeping safe online during our Safer Internet Week. Each class took part in special activities, including Year 4 who had their photos taken in their photo booth. Using props they have created they took some funny photos which are safe to share online. Looks like great fun! We are pleased to let you know that we have arranged for a FREE course for parents/carers via the website, ParentZone.org which you can take online. Details of how to register for the course have been sent home with your child. If you did not receive a copy, please contact the school office. As a parent or carer, you might find your children are onto the next new social media site every week. New trends and sites are emerging all the time - most recently the Music.ly and Live.ly sites. The UK Safer Internet Centre has pulled together some of the most popular, newer networks that young people are using, and given you a breakdown of what they do and why young people like them. You can find details below. Please be aware that primary school children are under the age limit for all of these sites. Children may be exposed to inappropriate comments/images/videos on social networking sites that are aimed at teenagers and adults. They may be at risk if privacy settings are not set correctly - especially if personal information and location are disclosed - and photos that are shared online should be chosen carefully. Meeting and chatting with strangers online poses risks to young people who might be vulnerable to grooming and online (and offline) forms of sexual abuse. It is vital therefore that your child knows how to keep themselves safe online. Further guidance on all the sites mentioned below can be accessed by clicking here. Name What is it? Why do young people like it? Musical.ly is a social networking site that lets you share your own versions of music videos, by filming yourself and/or your friends miming along to the lyrics of a song. You can view other people’s videos, and remix them. You can opt to make your videos public, or available to selected users only. Live.ly, made by the same developer as Musical.ly, is live video-streaming that allows users to broadcast live video to online friends. It’s a more interactive version of karaoke, and some users put a lot of effort into making their videos look professional or funny. It’s a fun thing to share with friends, and is particularly funny if the song you are miming along to is completely different to the music you normally like. Snapchat is an app that let’s you share photos and videos with friends. The images only last for a few seconds, then they automatically delete. You can also create a Snapchat Story that is a collection of several photos and videos shown together, that will stay ‘live’ for 24 hours, and then delete. You can share your Story with friends, or make it public. UPDATE JUNE 2017: There is a new location sharing feature called Snap Map. Young people can share their whereabouts with all their friends or just a select few. They can even set it to ‘ghost mode’ where they can see where others are without sharing their own location. This can be unsettling as you’re not always aware of who is tracking your whereabouts. You can add text, drawings, and emojis to the images you share. You can also use funny filters that can make you look like a cat, a cartoon, a policeman etc. You can also use the ‘Face Swap’ feature to swap features with another person in the photo. This has been extremely popular recently, with lots of these images being shared across other social networking sites. Instagram is a photo and video sharing network. Instead of ‘friends’, you have ‘followers’. Your Instagram feed is made up of the photos and videos posted by the people you follow. You can also tag people in photos, and mention people in comments using the @ symbol and their username. You can also ‘check’in’ and share the location of where your photo/video was taken. You can add different filters, and make your photos look very cool and professional. There are certain trends on Instagram, such as #tbt (Throwback Thursday – post on older photo) and #wcw (Woman Crush Wednesday – girls/women post a photo of a woman they admire). You can link your Instagram to other networks, such as Facebook, so your posts appear on both accounts. Periscope is Twitter’s new, live streaming app that allows users to live-broadcast from anywhere in the world. Users can also watch other people’s live stream if their feed is public. You can also choose to make the video available to certain users only. You can see on a world map where people are live streaming from - this might be from somewhere exotic and exciting, like South America, or down the road in the same town as you. Viewers can also send ‘hearts’ by tapping the screen as a way to show you like the video. You can also send messages using the chat feature too. For more app reviews from both parents and children, visit commonsensemedia.org for a balanced view. Always remember: respect others online, think before you post, and only accept friends and followers from people you know and trust. DigiDog and DigiPup have joined Year 2 to help them with their e-safety learning! In class they will talking about the things we should teach DigiPup before we let him go online, and every weekend one of the children from the class will be able to take DigiPup home. We would like the children to talk with their family about how they can have fun online and what's okay and what's not okay to do on the internet. They can also write a DigiPup diary or story to tell us what happened when they took him home and how they made sure he stayed happy and safe. Sajeel in Y6 did a super job last year as Pupil Representative for E-Safety. Pupils were able to ask for his support if they were worried about something online and he encouraged them to come and talk to an adult. We are pleased to say that Henley in Y6 is the new representative for this year. The Pupil Representative does not offer e-safety advice to the children but gives support and encouragement to report concerns to a trusted adult. We would like to thank Sajeel for all his work last year. E-Safety expert, Dan Hawbrook from the Lincolnshire Safeguarding Children's Board, had a very busy day at Belmont when he discussed internet safety in every class followed by a session for parents. Dan was keen to highlight all the good things about the internet but stressed the importance of keeping safe - especially the need to maintain privacy and to know what to do if something appears that is worrying or upsetting. In the fun and very lively sessions he demonstrated how to make a secure password and discussed the sort of information that can be put online. 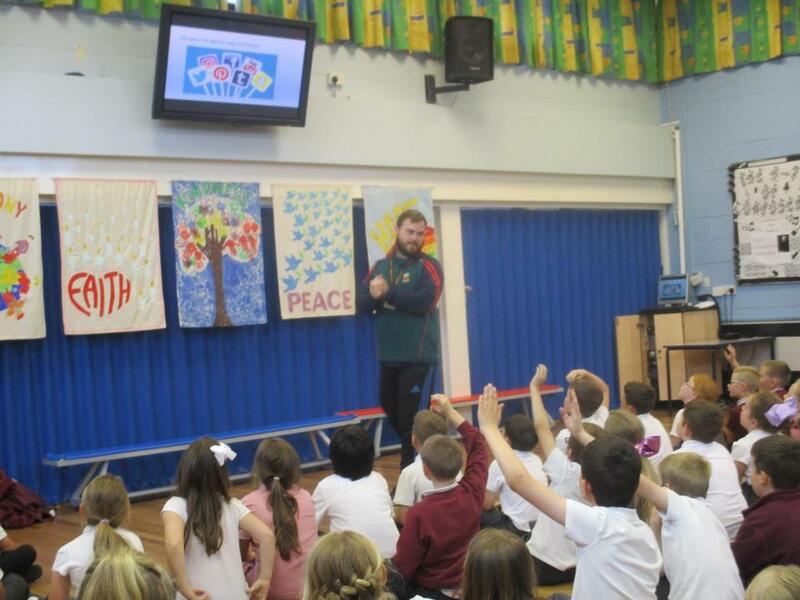 With the children in Years 5 and 6, he also spoke about sites such as Facebook and Instagram and the need to only play computer and online games that are age appropriate. Many thanks to the parents who were able to attend, we hope you found the information useful. We also look forward to Dan returning next year! We are pleased to let you know that all children in the school will be taking part in workshops throughout the day on Thursday 19 May to promote e-safety. These will be led by Dan Hawbrook from the Lincolnshire Safeguarding Children's Board. Parents are invited to an E-safety session with Dan after school, in the school hall, which should last approximately 30 minutes. He will be speaking about promoting the children's respectful and safe use of technology; the use of social media and other current issues. Dan will also answer any questions that may come up during the session. Children of parents wishing to attend will be looked after in a nearby classroom by members of staff. Children as young as Year 1 said they have received messages/comments via text, games or apps which have upset them or are inappropriate. This was reported by every year group. Children are using or have access to games and sites that are age inappropriate for them: Call of Duty and Grand Theft Auto for example. The age rating for these games is 18 years. YouTube is seen as a TV channel, when, as you know, some of the content is for adults only. X-Box Live and games such as Minecraft cause upsets when children have been unkind to each other online and the problems are then brought into school. Many children are registered with Facebook, Instagram and Snapchat – all of which have an age limit of 13 years. Children said they have received inappropriate comments on social media sites which they have found upsetting.This includes sites such as MovieStarPlanet which is primarily aimed at children. At Belmont, children are taught the SMART Rules for keeping safe online. The importance of not revealing personal information, taking care with photos and understanding the need for privacy settings are stressed. Children are encouraged to report worries or concerns to a trusted adult, keep copies of any evidence and report to the authorities where appropriate. We are proud that children have confidence in the staff at Belmont; trusting us to take appropriate action as we work alongside parents to ensure the safety of the children in our care. A letter regarding the above information has been issued to every family this week, along with a reminder of the SMART Rules and links to various websites, including our own, which we hope you find useful. We are also planning a workshop for parents on internet safety for after Easter, and look forward to seeing you there. In the meantime please contact the school office if you have any concerns or would like further advice. The Lucy Faithfull Foundation has produced a booklet, 'What's The Problem? ', that covers some of the issues which parents may struggle with when dealing with children and young people with regard to online safety. It explains what the issues are and gives straightforward advice, signposting to other websites and also directing parents to various helplines. The final part of the booklet helps parents complete a 'family safety plan' looking at staying safe as a family. This booklet has been recommended by Lincolnshire County Council. To download the booklet, please click here.